Horror represents the ripest genre to provide commentary on contemporary issues. Not only do horror films appeal to our basest emotions, they are the most malleable in terms of form and content. Stephen King writes in Danse Macabre that the three levels of Horror—revulsion, horror, and terror—not only conjure up a wide range of emotions in viewers, but also allow themes to grow out of the narrative—including those that wrestle with spirituality, faith, and morality. This column will explore how faith and religion are represented in particular staples of the horror genre. Vincent Price perhaps played his most sadistic role in Michael Reeves’ 1968 film Witchfinder General. The film is loosely based upon the real-life figure of Matthew Hopkins, who is believed to have been responsible for the death of over 300 people accused of witchcraft in the 1640s. Although Reeves’ contains many gruesome moments of torture, it would be more apt to consider the film as a historical revenge drama with horror elements, rather than a full-blown horror film. Still, the film is successful in how it portrays religious and political hysteria during the English Civil War. To place into a historical context, while the practice of witch hunting can be found throughout different points of history and in a variety of cultures, the forms in which most modern audiences are familiar with today—as seen in representations of the Salem Witch Trials such as Arthur Miller’s The Crucible—have more in common with their European counterparts from the 15th to 17th Century. A text entitled the Malleus Maleficarum was published in 1486 (“Hammer of Witches”) by a disgraced Catholic clergyman. Detailing ways in which to coerce a confession of sorcery through numerous torture methods, the book was dismissed by the Church, but was used by secular courts to try witches for their supposed crimes. It was the first text of its time to consider witchcraft as a form of heresy against the Church and God. Verses from the Bible and other documents—including Exodus 22:18 (“Thou shalt not suffer a witch to live”), were used as Biblical and theological reasonings for its listed practices. Another popular text concerning the detection and prosecution of witches was 1597’ Daemonologie written by the same King James who later authorized the popular imprint of the Bible. It is this dissertation that was widely referenced by Hopkins and other witch hunters of the time. In his own pamphlet, The Discovery of Witches, Hopkins cites Daemonologie as a major influence on how he conducted his inquiries. 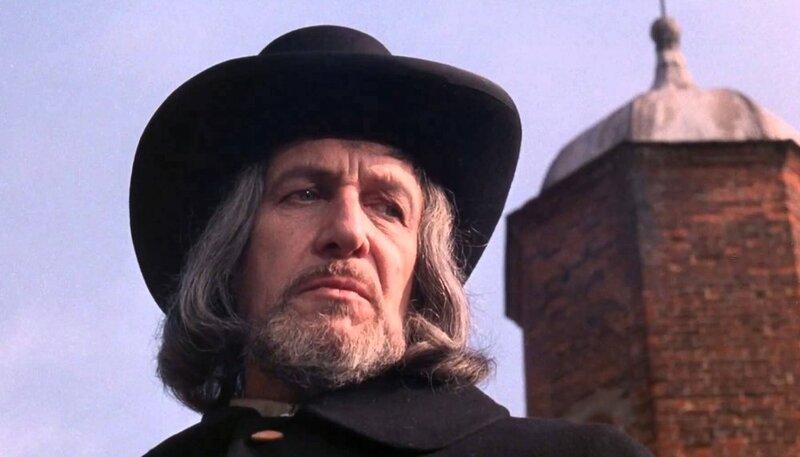 Whereas the real Hopkins died in his late twenties following his career as a self-proclaimed witchfinder general, the fictional version played by Price is middle-aged, but the restrained performance director Reeves brought out of him is ultimately sadistic and chilling. During this time, rather than try to prove acts of sorcery, witch hunters attempted to prove their suspect of having created a pact with the Devil. In the film, the mark is described as an area on the body that either does not bleed or experience any pain. At one point during the prickling exercise, Lowes cries out and utters a prayer in Latin. Although not a confession of witchcraft, it is seen as a sign that the priest is praying to the Devil. To end the torture, the priest’s niece Sara (Hilary Dwyer) intervenes and offers her body to Hopkins in exchange for her uncle’s safety. However, when Hopkins is called away to another town, Stearne rapes Sara. Upon returning, Hopkins learns what happened and decides to continue the torturing of Lowes and two other women accused of witchcraft. Using sleep deprivation and other tactics, they produce “confessions” and subsequently kill them through the act of dunking. Those who drowned were presumed innocent, while those who floated were deemed to have committed witchcraft and were subsequently hanged. Many viewers will recognize this technique parodied in Monty Python and the Holy Grail. Shortly after, a young Roundhead soldier named Richard Marshall (Ian Ogilvy) on leave to visit Sara, to whom he is engaged to be married, is horrified by the result of Hopkins and Stearne’s carnage. Again, you have heard that the ancients were told, ‘you shall not make false vows, but shall fulfill your vows to the Lord.’ But I say to you, make no oath at all, either by heaven, for it is the throne of God, or by the earth, for it is the footstool of His feet, or by Jerusalem, for it is the city of the great king. Nor shall you make an oath by your head, for you cannot make one hair white or black. But let your statement be, ‘Yes, yes’ or “No, no’; anything beyond these is of evil. Following this passage, Jesus delivers his teaching of turning the other cheek against your enemies. But Marshall does no such thing. Consumed with rage, Marshall forsakes his responsibilities to his military unit to pursue and kill Hopkins and Stearne. He is accompanied by two fellow soldiers. In the town of Lavenham, Hopkins obtains the trust of the local magistrate and uses his cunning to win the trust of the town. There, he executes a woman accused of witchcraft by burning her alive. ﻿Lavenham happens to be the town where Marshall asked Sara to flee for safety. Upon noticing Sara in town, Hopkins and Stearne devise a plan to trap both of them and use their influence to convince the town of their “witchcraft.” By charging Sara and Marshall with this crime, Hopkins and Stearne can silence any accusations directed at themselves. This is not the response of a man out for divine justice, but rather one born out of an obsession that descends into madness. Since his vow was one of personal revenge, there is nothing righteous in Marshall’s bloody killing of Hopkins. Despite the nature of Hopkins’ crimes, Marshall’s revenge can be viewed as heinous an act. The film then ends with Sara screaming as the credits roll. ﻿ Sean Woodard is a graduate of Point Loma Nazarene University and Chapman University. Focusing on a wide variety of interests, Sean’s fiction, film criticism, and other writing have been featured in Los Angeles Review of Books, Found Polaroids, and Los Angeles Magazine, among other publications. He is a journalist for Addiction Now and serves on the Film Department for Drunk Monkeys. A native of Visalia, CA, he now resides in Orange County.